In the initial, the section did not have independent building till 1970, since 1970-71 the section has provided with independent building. In early period only two courses viz., i) Elements of Economics and ii) Agricultural Economics were taught under the traditional system. 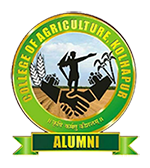 Later the course on Farm Management was added for undergraduate teaching. With the formation of Agricultural University in the year 1968 the traditional system was changed to trimester and finally to the semester system. A four year degree course was subsequently changed to three year degree course under 10+2+3 system. Subsequently the three year degree course was reverted to four year degree course with modified course outlay by including the recent development in the subject. In view of this, few more courses were added in the subject. In addition to core and elective courses the section has to guide students in Rural Agricultural Work Experience (RAWE) programme during VII semester and seven Experiential Learning Modules in VIII semester. Organised at VII semester regarding the subject.